Wall appliques are stickers that have a low-tack adhesive, allowing you to apply them to the wall and later reposition or remove them. Like any sticker, the adhesive will lose its grip over time, preventing you from reapplying the applique. The solution to this problem is to apply a fresh coat of adhesive that has the same low-tack qualities that the applique originally possessed. Low-tack spray adhesives are available at most craft and art stores. A can of spray adhesive will give your appliques new life. Open windows to provide proper ventilation. Wash the wall to remove any dust or fine particles. This gives the appliques the best surface to adhere to. Allow the wall to dry. Spread out several sheets of newspaper onto your work surface to protect it from overspray. Put the appliques facedown on the newspaper. 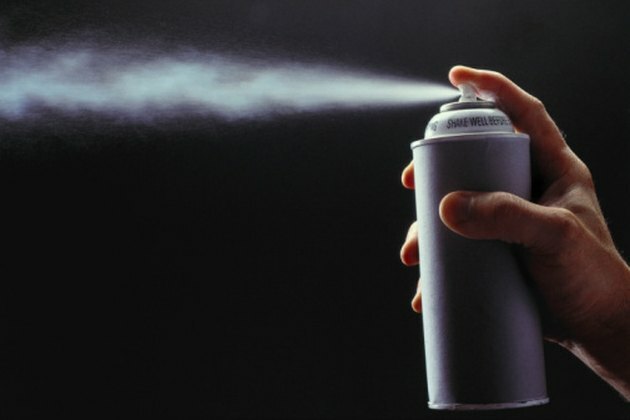 Vigorously shake a can of low-tack spray adhesive for a few seconds to mix the contents. Spray the adhesive onto the backs of the appliques in smooth, even strokes. You should spray from a distance of 6 to 8 inches. Apply the appliques to the wall.